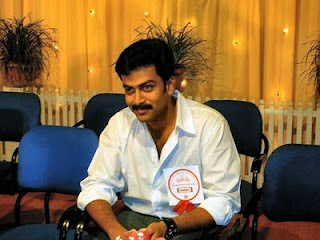 Prithviraj Sukumaran is one amongst my favourite actors in the current era. Movie after movie there is a small crowd (increasing) that nods in agreement about his bright future in Malayalam Film Industry. But off late a few social networking vandals have decided to eggface him. They edit his interviews, manipulate his movie clippings and make a meal out of it. The self joking sarcastic malayalee loves it. But this is going a bit par above the limits i guess. And i feel pity on this well off talented young guy(too young to become a star as some would say). He is well educated, well read and has a good notion about his responsibilities as an actor. For a young actor he invests his earnings back into the meagre earning malayalam film industry. And promotes malayalam industry wherever he speaks and solely believes in good movies to evolve from our industry. So why does the fellow bloody-mallu dislike him?? As i said earlier many amongst us are far too jealous on his achievements at this young age and to add salt on wounds he has that charisma around him. To further add he has an 'arrogant attitude', which again is decided by a few in our society. They prefer a soft spoken scoundrel to a bold individual possessing 'SPINE'. And there is a big media to back the 'vandals' i spoke before of. Apparently media is angry at him because 'he had an affair which he didn't disclose until his marriage'. C'mon every media baron must rethink the money they invest on gossips and page3. Its a case of media failure, where they couldn't unearth his affairs (if they were so much interested to begin with). Then there is a section of media who kept speculating him having an affair with Samvrutha Sunil (an upcoming fine actress in malayalam). There have been a few movies of them together to add spice to their stories\gossips. After Dileep-Manju, Biju-Samyuktha i guess media had lot of bets on Prithvi-Samvrutha in which they evidently crashlanded. Some dislike him for the manner in which he speaks about Mammooty & Mohanlal. A few emotionally blind fans demand more respect for their superstar icons. In many interviews time and time again he has stated both of them to be old and unfit to do a youngsters role, which is entirely true. Well malayalee junta doesnt care about the fact\truth behind it. All they want prithvi is to dance to their tunes sing songs and praise about the 2 M's no matter what (c'mon somebody needs a lesson on freedom of speech). A clap is heard when there are two hands, so to point out Prithvi's problem. He wears his heart on sleeve and acts as if he is an untethered soul. He publicly behaves as if nothing bothers him but contradictingly goes and defends his stance on every word he speaks or his every other action. The first step to a peaceful celebrity status is to show utter disregard to what others say or write about you. Prithvi fails big time here, he goes on and on defending his motives and inner voice but alas he knows that the very media is minting money out of him. The hero he is trying to portray is sold as a clown to the public by our own media. Many in our age group have only heard about the 'golden period' in Malayalam movies even though we just had to watch those old classic movies later on tv. A new revolution is happening in our industry and Prithvi plays a big part there. By pelting stones we are curbing the enthusiasm and interest around him. All this is because i dont want to be in a generation where there is a big hiatus after the 2 big M's of our industry. There are others to challenge the top position but we all know in back of our minds that Prithvi is miles ahead when compared to them. Quit belittling him fellow mallus...let the show continue. Picture Abhi bhi Baaki hai!!!!!! 100% true..I feel it is pure jealousy...but within 1 or 2 years he will rule the industry and e may hope to comeback our golden period after these old bunks removal.